We know that customers expect high-resolution copies and prints for personal and public use. The average person does not have access to these services and depends on a professional company to provide a fast and quality service. Our Glendale copy shop uses only commercial printing equipment to ensure the highest resolution can be transferred from original copies or reproductions. Every project is unique, but every project requires high quality printing to attract attention. The creation of digital printing technologies makes it much easier to receive full color copies at a competitive price. These copies were out of the price range for most customers only a few years ago. Our Glendale copy shop provides both full color and black and white copies that produce accurate color representation and crystal clear text that is easy to read using different font types. Copies can be produced from digital files or document reproductions to achieve amazing results. Professional printing is not only for business owners. Our copy shop Glendale center makes it easy to receive any type of printing available. Customers may need short run printing for office parties, weddings, retirement gifts or family use. Authors, musicians, self-employed workers, schools, churches and nonprofits need high quality printing at competitive prices to showcase announcements, advertise creations or special events. The right mixture of graphics and materials helps to create memorable printed products. 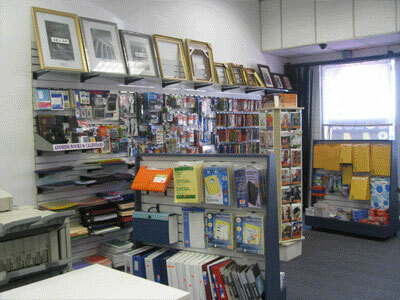 Our copy shop in Glendale provides industry standard services for graphic design, postcards, flyers, office supplies and legal forms, photos for passports, photo to poster enlargements, brochures, full color printing, black and white printing, mounting and laminating, envelopes and letterheads, copying and book binding, oversize copies, promotional items, custom banners, roll-up banners, calendars, magnetic calendars, full color signs, mousepads, presentation folders, business cards and custom t-shirts. These services are used for business, personal and nonprofit use. Selecting a capable printing company is one of the ways that printing orders can be completed on time. Delays are common with inexperienced companies and these delays can ruin a deadline or special event. Our Glendale printing shop has no trouble completing large or small print jobs for requested turnaround times. The use of high quality commercial printing equipment gives our customers access to the best printing currently in the printing industry. Printing methods in the past required complicated color processes to produce full color printing. The use of screen printing technology required film separations for each color and this increased the cost. The printers used in our Glendale printing shop can produce color and black and white prints faster and easier with a competitive price designed to fit into any budget. Every customer has access to full color printing capabilities for personal and public distribution. Commercial printing is not only used for businesses, schools or nonprofit companies. Regular customers take advantage of the high quality printing that is achieved to create gifts for anniversaries, parties and family use. Customers depend on our printing shop in Glendale to produce a variety of items that need high-resolution printing to showcase photos, graphics and textual designs. We care about the quality of the finished output and make sure each printing job is professionally completed. Our investments in technology and printing services would not be complete without investments in our ordering system. Our customers enjoy the ability to order at our website, by telephone or by a quick visit to our printing shop Glendalecenter. Our graphic designers check every order for accuracy before it is completed. Finished orders can be picked up by local customers or shipped to any destination selected during the ordering process. We make it easy to order and receive high quality printed materials. Residents of Glendale, CA in zip codes 91201, 91202, 91203, 91204, 91205, 91206, 91207, 91208, 91209, 91210, 91214, 91221, 91222, 91224, 91225 and 91226 can call (818) 775-0255 to learn more information about our services.